The open concept design of the room makes it feel bright and spacious. The fireplace allows gives a cozy and welcoming feeling to the space. Since this isn’t a huge home, we knew the white woodwork would make the space feel larger while the hardwood floors balance and ground the space with warm tones. So much to love in one room! We selected a 12” x 24” tile to match the surround. It is bright, white, and classic! White carrara marble mosaic tile in brick set design was the perfect selection for the fireplace surround. We selected a classic, simple style of fireplace mantel. It came in pieces with instructions for installation. The painter then prepped and painted it white to match the woodwork in the home. This beautiful semi-flush mount light was the perfect transitional touch for the entryway. 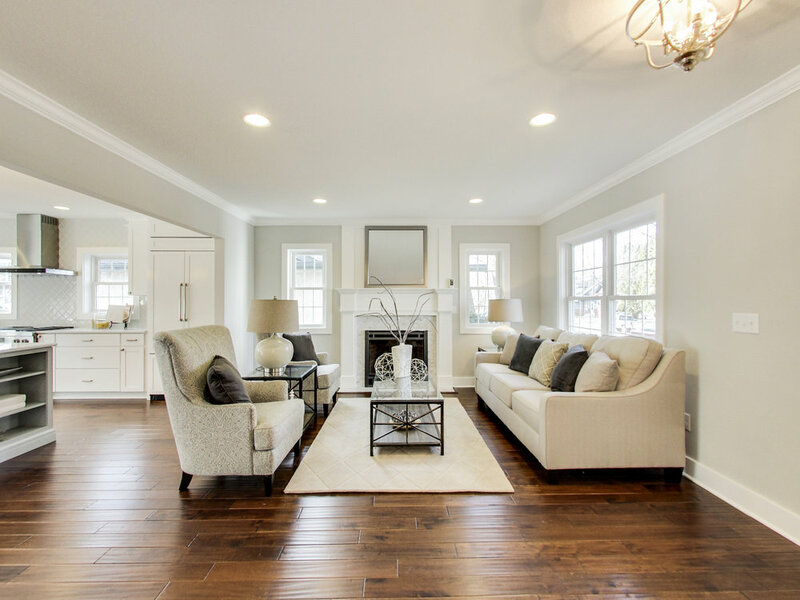 A beautiful dark brown hand scraped solid hardwood floor accents the white trim and warms up the feeling of the room.